Successfully Added Dual Powered 5.0M Pixel Digital Camera - 3 Function Modes to your Shopping Cart. Great looking Digital Camera with a 5.0 Mega Pixel CMOS Sensor, 3 function modes (Digital Camera, Digital Camcorder, and Web Camera), and a handy dual power feature letting you power the camera with the included rechargeable Li-ion battery or 3x AAA Batteries for maximum convenience when on the road. Also thrown in this Wholesale Deal is an included high brightness light that can be attached to the top of the camera or to the side for extra light, a SD slot for expanding the memory up to 2GBs, and the ability to take 12 Mega Pixel Pictures via interpolation. 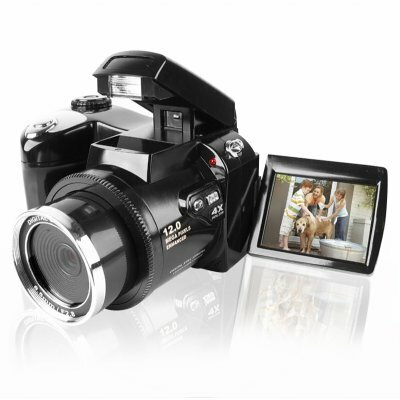 A great looking Digital Camera and a great wholesale deal available direct from Chinavasion and with a one year Warranty. I really enjoy the fact that there is a video that helps people put it together. I bought this and its like plastic looks really cheap, like an off name brand. Its takes Pictures so if that is all you really need and you dont care how you feel about how it looks than you are good. This item looks good on the box but not in personal. I will give teh one I bought to a teenager because if they broke it (which they will because its plastic) then you won't cry over it. I still love shopping here this was just no an item for me.